American Omens is the story of three people who are caught up in a web of intrigue centered on a conspiracy to eradicate Christianity. Will Stewart, Jon Dowland, and Cheyenne Burne all play different roles in the story. Jon Dowland is the assassin tasked with taking out influential Christians, thus silencing them and diminishing the faith’s influence on society. Will Stewart, a failed bookseller, is knee deep in financial and family despair when he is approached, and challenged, by a mysterious stranger. Cheyenne Burne is a top tech guru who receives a message from her missing father and subsequently is thrust into a series of events that put her very life in danger. I was excited to read American Omens: The Coming Fight for Faith by Travis Thrasher. I love a good thriller! The beginning was really captivating, and the pace of the book kept up…until the middle where it just seemed to go into slow-mo for a while. I enjoyed the ‘thriller’ aspects of this book, and there are some really pertinent points made about the way our lives are being monitored by algorithms. In the future portrayed in American Omens, everyone is monitored by a personal device called a SYNAPSYS. There are many, many things a SYNAPSYS is capable of doing, things that people have no idea about….It used to be that people were scared about Facebook keeping their data on the recipes and cat pictures they liked. They have no idea. In wanting life to be easier and faster and better all around, people have allowed themselves to be monitored. And even worse, manipulated. Where Thrasher went too far, in my estimation, is putting the monitoring into the hands of one, fictional mega-corporation, Acatour, run by one man, Jack Heyford, and inferring that he’s just the latest in a giant conspiracy. Heyfor’s a part of something that’s been around for decades. The world government. The New World Order. The Freemasons. The Illuminati. The deep state. The cabal. Names for secret societies that have become cartoons and comic books. Words that are punch lines. The figures change, and so do their names and networks. Yet the evil remains the same. One other thing that was just ‘off’ to me was a passage late in the book where two of the characters are sneaking into the headquarters of Acatour in disguise. ” …Malek wore glasses, and Cheyenne had her hair in a new style with it tied to one side, making them look different enough for the cameras monitoring everything not to instantly pick up on them if people were, in fact, looking for them” (American OmensARC p.274). So, I’m supposed to believe that technology is so advanced that we have self-driving cars (Autovehs) everywhere, and programs with such advanced algorithms that they nearly read our minds, but we don’t have facial recognition?? I believe that we ARE being surveilled by algorithms and that Christianity IS under attack, but I think it’s a much less focused effort on the part of any one human, earthy entity. Businesses are surveilling us because it makes them money. If it makes them more money, they’ll do it…throwing privacy concerns to the wind. I don’t have an Alexa for that very reason. “She’s” always listening. Freedom of religion is under attack. Holding beliefs that are not “politically correct” on homosexuality or abortion are mocked at best and considered hate speech at worst. There IS a conspiracy to control us. There IS a conspiracy to stop the message of Christianity from spreading. There IS one man at the root of this conspiracy. His name is Satan. He’s not using just one man, one company, or one organization to accomplish his evil work. He’s using millions of them. When we look for boogie men in the world, we forget that there is a very real force behind them. The way to combat that is to read our scriptures, study, and pray. Not watch conspiracy videos on YouTube. Overall, the book is interesting but I just felt it was pandering to the conspiracy theory, flat earth types. What’s the TRUE meaning of Easter? If someone asks the question “What’s the true meaning of Easter?” and your answer conjures up images of a lilly, a chocolate cross and a boring church service you might need to read “The Chasm” by Randy Alcorn. This is definitely not the pastel Easter we’ve grown up with, nor is it a conventional story of the Passion. 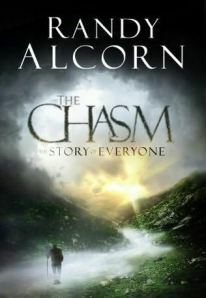 “The Chasm” is an allegory for what the death and resurrection of Christ really means to fallen humans in a broken world. The story of a traveler in a strange and unsettling land, this short book by Randy Alcorn is the saga of Nick Seagrave (Edge of Eternity, by Randy Alcorn). Nick sees his life and his actions superimposed on a world that he must struggle to grasp. What is true? What is real? What is illusion? What matters? Nick finds answers and you might, too. Including thought provoking questions from each chapter, this book is a great reminder of God’s gift to us via the cross and all that the grace of God means. Share with a friend! Suzanne Kidwell is the host of the sensational, expose’ cable show “Judgement Day”. So what if she cuts a few corners, embellishes a few truths and disregards facts? The means justify the ends, right? Suzanne has the high ratings and fame associated with her go-get-’em show but that doesn’t protect her when her physician-boyfriend ends up dead in an explosion meant for her. When his nurse shows up dead on her apartment floor she is framed for the murder. Suzanne has made plenty of enemies along the way, so it is easy to find people with motives to do her harm. What has she stumbled upon that is so important that they want her dead? Marcus Crisp, and his partner, Alexandria Fisher-Hawthorne are two private investigators brought in to help prove her innocence. Despite a romantic history with Marcus, Suzanne is forced to accept their help. What ensues is a page-turning suspense story that will have you asking a lot of questions! Cloaked in a fast-paced detective story, Judgement Day raises a number of extremely subtle issues. It is a story of situational ethics and the snowball effects of selfishness. While the situations presented in the book are obviously extreme, each of us faces a myriad of small decisions every day that are pinned on situational rights and wrongs. What principles guide your life? Although the book is categorized as Christian Fiction, the “Christian” content is more implied than overt. While you’re enjoying the fast-paced, wild, edgy ride you are subconsciously challenged to think about right and wrong. I enjoyed the book.